The overall prevalence of polyneuropathies is at 2.5 %; in individuals over the age of 55, this number climbs to 8 %. 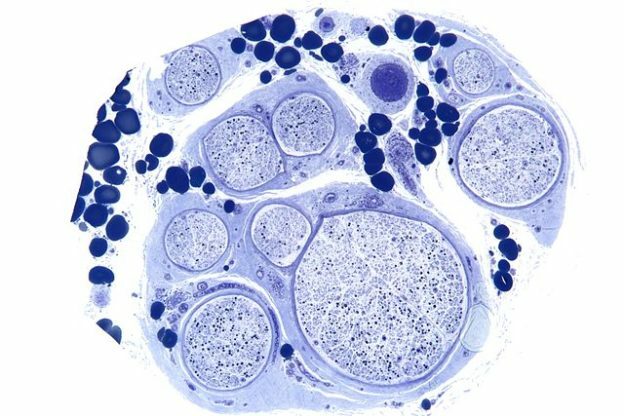 The number of causes of polyneuropathies is estimated at approximately 100; in approximately 20 % of patients the cause remains undetermined. 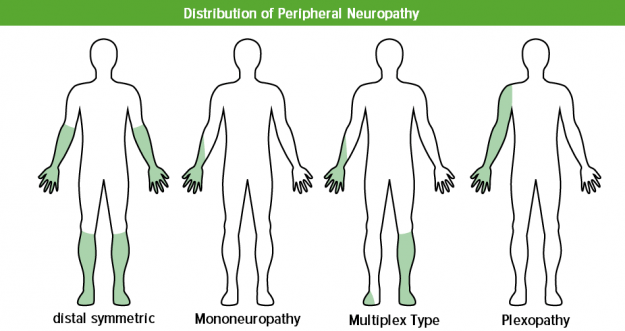 This article will provide you with information about hereditary and acquired polyneuropathies. You can read everything about Guillain-Barré syndrome as well as Miller-Fisher syndrome in the article regarding inflammatory and immune-mediated polyneuropathies. Note: The goal of diagnosing polyneuropathies is always clarifying the etiology in order to achieve successful therapy! Note: Diabetes mellitus and alcohol abuse combined are responsible for almost 50 % of all polyneuropathies. Case study: A 60-year-old patient has known for several years that his blood glucose levels have been in the pathological range time and again. For the past year, he has been experiencing slight sensory disturbances in his toes and the foot soles. The skin is becoming dry. After a longer walk, he notices pain-free changes in his left foot resulting in pressure points in his shoe. The orthopedic examination, which includes X-rays of the foot, shows a fracture of the arch, the so-called Charcot foot. He receives orthopedic and podiatric treatment. With appropriate footwear and skin care, the patient will be able to walk normally again. Now he is experiencing morning sensory disturbances in his right hand, whereby predominantly the fingertips of the first three fingers fall asleep. Some mornings, pain and clumsiness in the hand occurs. The treating general practitioner wonders if the sensory disturbance is the result of a PNP. If vegetative nerve fibers are impacted, vascular dysregulation with distal cyanosis can occur, resulting in hyperhidrosis, anhidrosis as well as trophic changes in the skin and nails. As far as the patient’s medical history is concerned, you should be looking for familial predisposition. Neurography: A tool to distinguish between axonal, demyelinating and axonal-demyelinating diseases. In demyelinating diseases, the nerve conduction velocity is reduced. There is some temporal dispersion as some nerves conduct faster than others and thus cause widening of the CMAP duration. In axonal diseases, the overall muscle action potential is reduced. Thus, reduces CMAP and SNAP amplitudes. D = demyelinating in cases of diabetic PNP. A = axonal in cases of asymmetric diabetic PNP and alcoholic PNP. 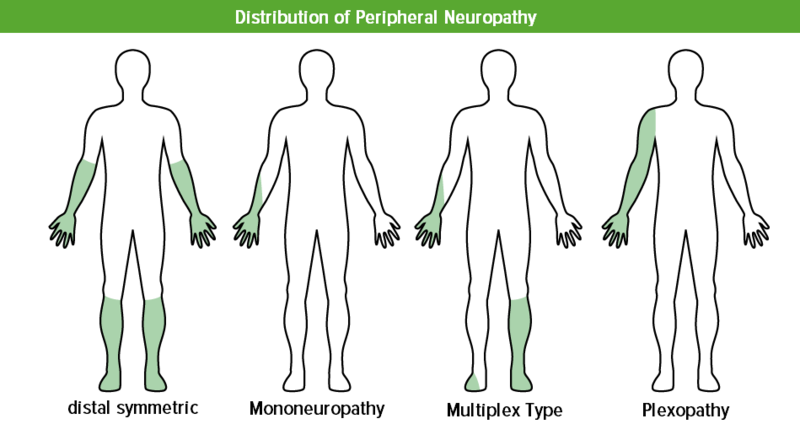 Hereditary motor and sensory neuropathies are divided into seven types. Only the first three are of clinical relevance and will be discussed in the following paragraphs. Charcot-Marie-Tooth disease is the most common hereditary neuropathy. This autosomal dominant type inheritance is among the demyelinating neuropathies. Affected individuals fall ill between the ages of five and 20. In most cases, positive family history and high arches result in the diagnosis of suspected Charcot-Marie-Tooth syndrome. Biopsies find onion-bulb-like arrangement of Schwann cells with simultaneous axonal degeneration. Demyelinisation extremely slows down the nerve conduction velocity which can be seen in neurography imaging (> 20 m/s). In approximately 70 % of all cases, molecular genetic diagnostics shows a duplication of the PMP22 gene. Note: The normal nerve conduction velocity is >40 m/s for the legs and >45 m/s for the arms. Therapy focuses on treating the symptoms, healing has been impossible so far. Autosomal dominant inheritance is also the case with HMSN II. The reduction of the nerve conduction velocity in individuals with HMSN II is less pronounced. Clinically, there are barely any differences between HMSN I and II; however, they are clearly different in their biopsy findings: HMSN II does not exhibit onion-bulb-like arrangements, but rather displays axonal degeneration with secondary demarcation. Therefore, HMSN II is sometimes referred to as axonal form of Charcot-Marie-Tooth disease. The clinical picture of HMSN III is also that of autosomal dominant inheritance. The clinical picture of this neuropathy is also very similar to HMSN I, but it is much more grave. Affected individuals only have a nerve conduction velocity of 10 m/s, and the disease already begins in the first decade of life. Vascularinvolvement, a microangiopathy of the vasa nervorum occurs, resulting in multifocal fiber loss. Metabolic involvement can be deduced from the fact that the symptoms improve if blood glucose levels are adjusted well. Immunological genesis could be proven by showing inflammatory infiltrates in the autonomic ganglia. The above factors are thus intertwined to formulate the theory that, uncontrolled sugars in diabetics leads to non-enzymatic glycosylation that causes accumulation of advanced glycation end products. This induces cytokine and adhesion molecules release that may damage nerves leading to neuropathies. The clinical picture of a patient with diabetic neuropathy offers a wide spectrum of symptoms. The following table will provide you with an overview of common symptom groups. The most frequent one is the symmetric distal sensorimotor polyneuropathy. The clinical signs will lead you to the diagnosis: nocturnal paresthesia, weakened reflexes, reduced vibration sensation and anhidrosis are particularly typical. In lab tests, you will determine the blood sugar levels of glucose and HbA1c and conduct a 3 hour oral glucose tolerance test (OGTT). Another diagnostic tool being used is neurography or a simpler monofilament test to represent innervation lesions (see table). The diabetic metabolism must be normalized in the best possible way! Here, you can read everything about how to treat diabetes mellitus. If the glucose levels are well adjusted, it is possible to halt the progression of the symmetric form. Furthermore, α-lipoid acid can be used to counter nerve damage. Pain therapy consists of opioids and antidepressants, and anticonvulsants are used as co-analgesics. In order to retain motor function, physiotherapy is important and useful. The combination of the direct toxic effect of alcohol and the vitamin B deficiency usually occurring simultaneously (due to malnutrition) causes polyneuropathy. Characteristic signs are primary axonal damage and secondary demyelination. Affected individuals suffer from symmetric distal failure impacting the sensory and motor system. Typical signs are „burning feet,“ weakened reflexes, reduced vibration sensation and ataxic gait. Palmar and plantar hyperhidrosis as signs of autonomous system disorder are rare. Lab tests show the typical values pointing toward alcohol abuse: elevated liver enzymes, elevated MCV values as well as elevated carbohydrate-deficient transferrin (CDT). Neurography imaging shows signs of axonal damage. Note: Carbohydrate-deficient transferrin (CDT) in connection with alcohol abuse is a favorite of the IMPP for the medical exam! Absolute alcohol abstinence is of the utmost therapeutic priority. Furthermore, vitamin B complex should be prescribed. Axonal reinnervation is possible with abstinence but will be delayed for some time. Approximately 70 % of the patients suffering from sepsis and multi organ failure will develop critical illness polyneuropathy (CIP). Septic inflammatory reactions are suspected but the pathogenesis of CIP has not been determined to its full extent yet. Affected individuals suffer from symmetrical flaccid atrophic paresis beginning from the distal side. Respiratory muscles may be affected as well. Unfortunately, CIP is frequently overlooked in intensive care as electromyography and measuring the nerve conduction velocity is required in order to make the diagnosis. In most cases, weaning the patient off the respirator is only difficult due to the fact that the patient is indeed suffering from CIP. The EMG will reveal pronounced pathological spontaneous activity. Once patients recover from their severe underlying disease, complete remission from CIP is possible and frequent. With regard to the patient’s intensive care, however, problems may develop due to their prolonged time on the respirator. 2. Which symptoms are typical for autonomic polyneuropathy in the context of diabetic polyneuropathy? Disturbances of sweat secretion (distal anhidrosis, proximal hyperhidrosis). Lancing pain in the groin/ilioinguinal region. Paralysis of the abdominal wall. Damage to the motor portion of the lumbosacral plexus (plexus lumbosacralis). 3. Charcot-Marie-Tooth disease is the most common form of hereditary neuropathy. Aside from stork legs, which foot deformity belongs to the clinical picture of an autosomal dominant inheritance disease? Bertorini, T. E. (2010). Neuromuscular Disorders: Management and Treatment E-Book. In Hilton-Jones, D., & In Turner, M. R. (2014). Oxford textbook of neuromuscular disorders. Marrink, J., & Rijswijk, M. H. (1986). Amyloidosis. Dordrecht: Springer Netherlands. Netter, F. H., Jones, H. R., Srinivasan, J., Allam, G. J., & Baker, R. A. (2012). Netter’s neurology.